Alright, here is part two of the glitter set swatches! 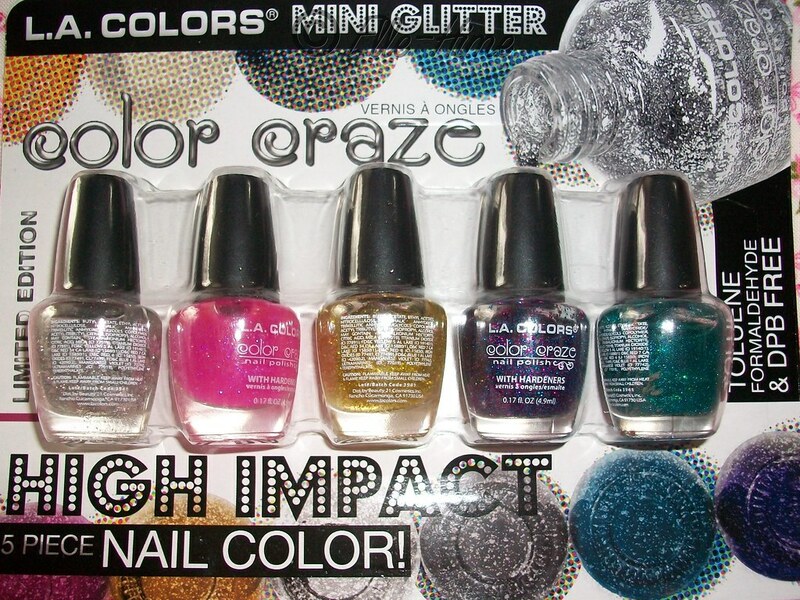 This is LA Colors Mini Glitter set 126. I have more pics and descriptions after the jump, along with the unlabeled polish dupes! a Clear with Silver glitters - rebottled Sparkling Diamonds. Silver hex and small glitter, the hex glitter likes to stay in the bottle. a Hot Pink with Opalescent glitter - the jelly base adds a hint of pink, but nothing as vibrant as the bottle. The tiny glitter seems more sparse than all the other mini glitters but spreads nicely. The iridescent glitters mainly flash blue, purple, and green. a Clear with Yellow glitter - very likely to be Gold Sparkle? Tiny bright yellow/gold glitter, not extremely dense. a Clear with Multi glitter - gotta be rebottled Jewel Tone! The popular pink, purple and blue combination of tiny glitter. This is quite packed with glitter and spreads nicely. a Clear with Blue + Green glitter - the color Treasure Island rebottled. The micro glitters have a teal look since they are mixed so nicely, but you can distinguish at least two different colors. Applies wonderfully. My swatches are just one coat, done left-to-right in their packaged order. Just like set 124, I like this collection of glitters, as well. The unnamed pink one is the least exciting, but could be used to add a hint of sparkle to a toned down manicure. These are colors that I'm glad to have small bottles of. Jewel Tone is a color that nearly every brand has done before - no one can deny that the mix of glitter looks great together. And you know what, I didn't own one like it before buying this set! It felt overdone so I never picked one up, but I'm happy to have a mini bottle. Treasure Island is wonderful, and I can see it layering with Aqua Crystals (from the 124 set) for fantastic mermaid nails. These mini sets are easy to work with polishes that I'm glad to have to play with. If you already have glitters just like these you may want to pass unless you need a travel size. I'd say they make great gift sets, or you can use them to sample L.A. Colors polishes if you're curious about them. I also bought their Brights mini sets and my next L.A. Colors project will be swatching and identifying those. Thanks for reading!